This one was not dramatic. It wasn’t a nailbiter. At no point was it the least bit suspenseful. No, we just had to deal with the fact that we were on top from the very beginning. Somehow, it wasn’t that hard to adapt to that kind of situation. Somehow, when we’re busy cleaning up like that, it just feels natural. Aceves started this one, and I have to say that he did an absolutely spectacular job. Just going in there and randomly starting a game when you’re not doing it on a regular basis is no easy task, but Aceves made it look like just that. He pitched six innings of one-run ball, giving up seven hits, three walks, and four strikeouts. Even that one run was the result of just one isolated mistake; Aceves missed his spot with a fastball thrown with one out in the third, and it was hit for a solo shot. Other than that, his start was as solid as solid gets. So was Mortensen’s seventh. The same can not be said of the eighth. Mortensen gave up a double to start the frame. Then there was a fielder’s choice, and then he was replaced by Miller. Miller gave up the second home run of the night for the Phillies; this one, though, was a two-run home run that came on a slider that missed. Fortunately, it didn’t matter. We were way beyond the point where another two runs would have counted for anything. The Phillies scored three runs all game, and all three came via the home run. Well. We scored three runs in the first inning alone, and all three came via the home run. First, Ellsbury singled. Then Nava grounded out, moving to Ellsbury to second. 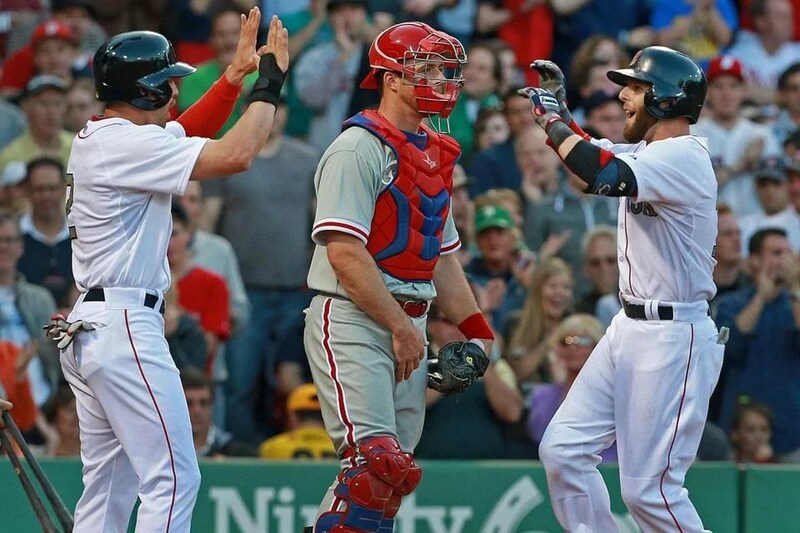 He took third on a wild pitch, and then on a 2-1 count, Pedroia got a bad cutter and made the Phillies pay. He rocketed the ball right around the Pesky Pole. And we all know how small of a guy Pedroia is and, therefore, how awesome it is to see him just unleash on a ball. And it’s not like the ball took its time leaving the ballpark, either. It was awesome. Papi struck out. And then Napoli went yard on his first pitch of the game, which was also a bad cutter. This one went beyond the fence in right center. And we all know the kind of power that Napoli possesses, so he just made it look so easy and so effortless, like it was the most natural thing in the world that he would be doing at that moment. Then Drew walked, and Carp flied out. End inning one. We had two runners in scoring position in the second but didn’t take advantage of that opportunity. Not that it mattered in the end. We were back at it in the third anyway, doubling our run total. Papi doubled and scored on a double by Napoli, who scored on a single by Drew. Carp struck out, Salty singled, Iglesias popped out, and Ellsbury doubled in Drew. Unfortunately, Salty was thrown out at home, but again, it’s not like it mattered in the end. We went down in order in the fourth and resumed in the fifth. Napoli struck out swinging to lead it off, and then Drew singled, Carp doubled, and Salty hit a bases-clearing single with a little help from a fielding error. We took a break in the sixth and seventh and padded our lead even more in the eighth. We had the bases loaded with two out, thanks to a single and two walks, and the pitcher to whom the Phillies had turned that inning walked in a run. All Drew had to do was stand there, wait, and accept what was given to him. Fantastic. Bottom of the ninth? With a score of 9-3? I don’t think so. Winning a close game in late innings is nice. Winning a close game, period, is nicer. But just plain winning at all is the nicest. Especially against the Orioles with the way they’ve been playing this year. By the way, let’s take a moment to ruminate on how strange and bizarre that really is. I think I speak for everyone when I say that if you said during Spring Training that the Orioles would be in the elite of the AL East, it would have been absolutely impossible to believe. And here we are sitting on top of one of the division’s best teams, for one game at least. The whole thing was a pitcher’s duel right to the end. Doubront, for his part, was absolutely stellar. This was one of his best starts of the season. He pitched seven innings, gave up one run on four hits, walked two, and struck out a career-high eleven batters. His command and control were phenomenal. The end of the season is almost here, but he didn’t show it at all. He looked like an old pro. He went one-two-three in the first and fourth, and he issued one of his walks in the second and the other in the third. He allowed his one run in the fifth and was actually fortunate to limit the damage; he opened the inning by allowing a single followed by a double and then an RBI single. But he finished the inning strong with three straight outs. He went one-two-three in the sixth and gave up a single in the seventh. So the only inning during which the O’s had more than one runner on base on Doubront’s watch was the fifth when they scored. And of his strikeouts, five were swinging, five were called, and one came on a foul tip. His fastball, changeup, and curveball were the best I’ve ever seen them from him and were absolutely on fire; they were moving when they were supposed to and not when they weren’t. He was a master. In short, he was absolutely fantastic. Tazawa took the ball in the eighth and sent down his three batters. Bailey came in for the ninth and got into, and then fortunately out of, trouble. He induced a groundout to start the inning but then gave up a single and a double before issuing an intentional walk, which loaded the bases. But the inning ended up ending without incident thanks to a force out and a strikeout. Meanwhile, we actually had scored first, so Baltimore’s run actually tied the game. We had two on in the first, one on in the second, and none on in the third. But Ross singled to lead off the fourth, Loney walked, Salty flied out, and Valencia grounded into a force out which scored Ross. Loney was out at second, Valencia ended up reaching first on a throwing error, and Nava singled after that, but the inning ended with Iglesias flying out. We went down in order in the fifth and we had one on in the sixth and seventh. We scored our winning run and the last run of the game in the eighth. Pedroia and Ross hit back-to-back doubles to lead it off, and that was that. Literally, because the inning ended with three straight flyouts. Unfortunately, Doubront wasn’t in line for the win, so Tazawa got it, and Bailey picked up the save. The final score, obviously, was 2-1. And it was sweet. Last but not least, Fenway Park opened after the game for a special and well-deserved tribute to Johnny Pesky. Sox greats through the ages gathered to celebrate the man, the myth, and the legend. Pesky was a great man, and there was a lot to celebrate. And I have to think that Pesky would really have enjoyed Ross’s catch in the first of a ball that looked very much like a Pesky-esque home run for the Orioles. The catch looked so unlikely, and yet Ross did it right at the Pesky Pole. I think Pesky would really, really have enjoyed that. In other news, the Pats dropped an exasperatingly close one to the Ravens, losing by the brutal score of 31-30. Wow. So much awesomeness in this game. Where to start? The beginning. Lackey. Lackey picked up his fourth consecutive win. He was shaky at first; I didn’t know if he would make it through. In the first, he made a mistake; he gave up a three-run shot, and I was thinking back to our pathetic loss to open the series and how much I really did not want to see a repeat performance, ever. But he settled down after that. He allowed another home run in the fifth, a solo shot, but that was it for the rest of his night. All told, he tossed five and two-thirds innings. He gave up four runs on eleven hits, but only three of those runs were earned; Youk, who returned to the lineup a day ahead of schedule, made a fielding error, which never happens. Just to be clear, I don’t think he made a fielding error because he returned to the lineup a day ahead of schedule. Anyway, Lackey walked only one and struck out three. Objectively, his start wasn’t great, but we’ll take anything we can get from him as long as he gets on the path to long-term consistent success. With the two-seam, four-seam, and cutter working as well as they did last night, he should have no problem getting there, although his changeup, slider, and curveball may prove to be stumbling blocks; although they’re excellent, they need to hit their spots more consistently. One mistake and you could have a night like the one Lackey just had where you allow two home runs. Granted, one of those was on a fastball, but still. Worth mentioning was his third inning: three up, three down, nine pitches. Done. Williams and Wheeler finished the game. Nobody earned a save because, trust me, it was nowhere near a save situation. The offense all began with back-to-back home runs by Ellsbury and Pedroia. That was as good an indication as any of the explosive run barrage that was to follow. Ellsbury hit his on the second pitch he saw last night. It was a sinker, and he bounced it off the Pesky Pole. It was a laser after Pedroia’s own heart. He saw that ball as clear as day, and it got out in a hurry. Pedroia, on the other hand, duked it out with Bruce Chen. He hit his home run on his seventh pitch, an inside fastball. Don was right; that ball had more than enough to get out of the park. On Monday night, he was a homer shy of the cycle, and late in the game he actually almost hit one out. So what does he do during his first time up last night? He hits one out beyond the shadow of a doubt. It was a laser in every sense of the word. To the Monster in a hurry. 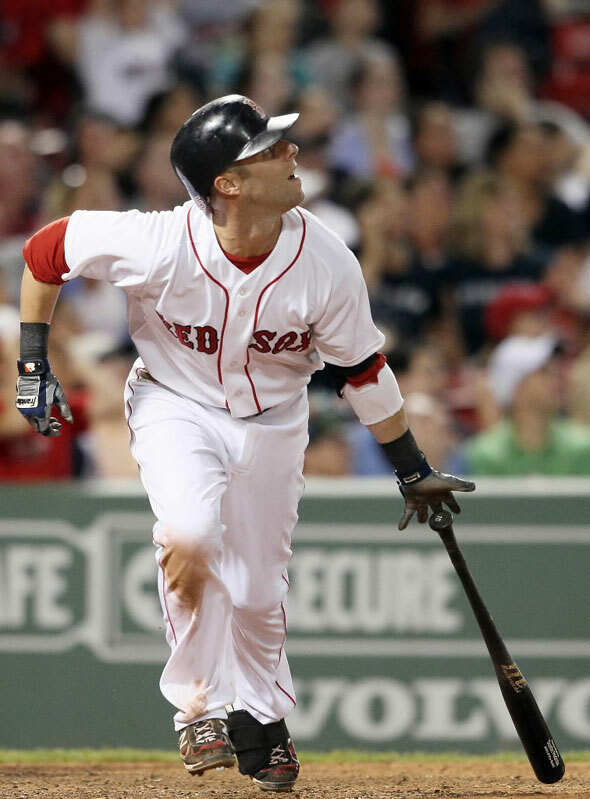 Pedroia’s hitting streak now stands at twenty-four games, the longest of any Red Sox second baseman ever. The bases were loaded for Ellsbury in the second. Ellsbury walked, Pedroia hit a sac fly, and Gonzalez grounded out. All of that brought in three more. But we really blew the game wide open in the fourth. McDonald doubled and scored on a single by Navarro. Then Ellsbury grounded into a force out and stood at first. Pedroia singled and Ellsbury tried to score but was thrown out at the plate. Gonzalez and Youk then singled. So the bases were loaded for Papi. When the table is set, Big Papi knows how to feast. It was the fifth pitch of the at-bat. So far, Papi had received a fastball, two sinkers, and a slider. The count was 3-1. Chen dealt another slider belt-high. And the ball ended up in the seats behind the bullpen. Big Papi hit his tenth grand slam and batted in his thousandth run for Boston. The only other players who have batted in a thousand runs for Boston are Yaz, Ted Williams, Bobby Doerr, Dwight Evans, and Jim Rice; Papi now finds himself among the headiest company. Think about it. They spent their whole careers here; he’s reached that milestone in his ninth year. That’s a big accomplishment. And it was against a southpaw. The ball was absolutely crushed. He unleashed massive power and just skinned it. Big Papi hit a grand slam. Ellsbury and Pedroia led off the sixth with a double and a single, respectively, so Gonzalez brought in another run with a single. The Royals picked up another run in the eighth, but Gonzalez got it back in the bottom of the inning with another RBI single. McDonald and Navarro went two for four. Gonzalez went three for five. Ellsbury and Pedroia both went three for four. Five extra-base hits: two doubles and three homers. And that’s how we came to win, 12-5. That, my friends, is how it’s done. We knew it was coming: the last game of the 2010 season and the start of a long. It’s been one interesting year; we started off with a horrendous April, and just when we were well on our way to the top, the injuries struck us right back down. It’s crushing. That’s the best way I can explain it. Like a car in a junkyard that’s been crushed into a cube. and it’s disappointing, and it’s frustrating, and there’s just nothing more to say. It wasn’t even our fault. The whole season just begs the huge question of what the team would have been able to do had it been healthy. I personally think we would’ve gone all the way. But we’ll never really know, will we. Ironically but ultimately appropriately, that was probably Lackey’s best start of the year. He pitched through the seventh inning for the seventh time in his last ten starts and was one out shy of pitching a full eight. He allowed three runs, only two earned, on six hits while walking two and tying a career high with ten strikeouts, six swinging and four looking. Strangely enough, you can actually thank Drew for that run. He dropped a routine fly ball. But in a manifestation of how completely underrated his defense is, that was the first error he’s made in 183 games. Lackey threw 118 pitches, eighty-one for strikes. He threw every single one of his pitches effectively; he commanded all of them, he mixed and matched them, he was aggressive with them, and he really challenged the batters to come and get him. They couldn’t. His zone was absolutely full. So he didn’t have the best or most consistent year, but he certainly finished on a high note, giving us a preview of what we can expect from him next year. His final record is fourteen and eleven with a 4.40 ERA. 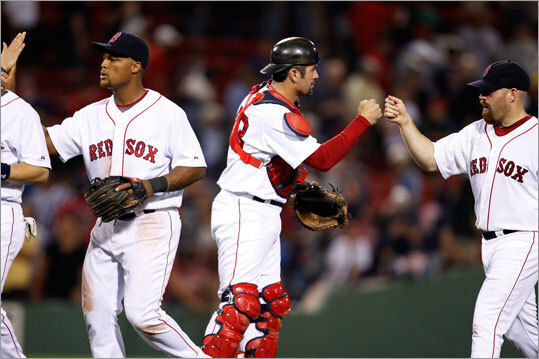 The bats backed Lackey and established themselves early. It was a thing of beauty. Drew clobbered a two-run shot in the first, his twenty-second and last of the season. He hooked a fastball down the middle to right field beyond the bullpen. Lowrie did the same in the fifth; he clobbered a two-run shot also to right. Lowrie was getting a steady diet of breaking balls, so he caught one down the middle and sent it out. We broke it open in the sixth, when we scored three. Kalish hit an RBI single, Anderson hit a sac fly for a run, and Kalish stole home on a double theft. We’ve really been running more than usual this weekend. Lowrie hit his second homer of the day an inning later. He took a cut fastball inside and sent it around the Pesky Pole, the shortest home run distance in the Major Leagues. Meanwhile, the bullpen wasn’t having its best day ever. Hill allowed his inherited runner to score. Bard received a hold for recording one out. Paps came on and allowed an unearned run for the second straight day. There was the unearned run, a hit, a walk, and a strikeout before the season finally ended with us on top, 8-4. I’m just as unprepared as the next fan to say goodbye to baseball and the team for a whole six months, but I’m glad we ended it on a high note. I’m glad we won the final season series, kept the Yankees from winning the division, and went out with a bang like we wanted to. So that’s it. That’s all for 2010. We finish in third place with a record of eighty-nine and seventy-three. For the first time since 2006, we won’t win ninety games. So we split the season series with the Yankees evenly at nine and nine. And we have no idea what we’ll look like next year. Beltre, V-Mart, and Papi, who ironically ended his season with a successful bunt of all things but received a massive standing ovation and a curtain call afterwards, will all be free agents. Tek received an enormous and very well-deserved standing ovation after almost hitting a home run. He almost lost it, and we almost lost it. The captain. He was there for 2004 and 2007. Most likely he’ll be back next year, but there’ll be plenty of time to talk about that. Right now, we can feel crushed and devastated and all those things that show the kind of loyal and dedicated fans that we are. We can be proud of ourselves for what we’ve accomplished this season despite our vast limitations. It’s been one interesting ride. I can’t believe it’s over, but I think we all saw it coming a mile away. But no matter how much you’re forewarned, you’re never quite ready. One thing’s for sure: there’s always next year, and next year we’ll be back with a vengeance. Jon Lester was this close to throwing a perfect game. He carried the bid into the seventh inning. The seventh inning! Six-plus literally perfect innings! I don’t even want to think about how hard it is for a pitcher to throw something like that. It’s ridiculous. It’s absolutely insane. And it was Lester! Yeah, he’s back. I think by now that’s the understatement of the century. If the kid can throw six-plus perfect innings, he’s so back it’s not even funny. I mean he was on. He was so on it was scary. Batter up, batter down. Plain and simple. Perfection. But then with one out in the seventh, Michael Young doubled to left center, and that was the end of it. It was devastating. Like I always say, at least it was clean. But at the time you don’t think about that. At the time you’re just really, really, really frustrated and disappointed. But it just goes to show you that a perfect game for Lester isn’t a pipe dream. The kid just pitched a no-hitter, and he went for perfection last night. It was a serious possibility. And even after the bid was broken, the result most definitely wasn’t too shabby. A complete game (a big thank-you from the bullpen), a run on two hits, two walks, and a new career high of eleven strikeouts. Eleven. Did I mention he’s back? And so was the offense. We won, 8-1. It was awesome. Plenty of everything: runs, RBIs, walks, hits, homers; you name it, we did it. Let’s start with Lowell, who hit, walked, scored, and plated one via the long ball, but not without some commiseration on the part of the umpires. The ball hit the upper part of that ledge on the Green Monster a few feet from the foul pole in left field, and Jeff Kellogg initially ruled that the ball stayed inside the park. But we’ve been down this road before, and the call for that scenario is always that it’s out. The umpires used instant replay, and sure enough the call was reversed to give Lowell his ninth of the year in the second inning, a solo shot that proved to be what started it all, because after that the slugfest continued. Pedroia went two for five with two runs, and two RBIs. Ellsbury walked. Youk had a hit and an RBI. Bay had a hit and two RBIs. Tek and Baldelli both hit, walked, and scored. Green scored. And let’s end with Big Papi, who hit home run number two! Sixth inning, nobody on, nobody out, high changeup, and it hits the Pesky Pole. Nicely done. James Wright, president of Dartmouth College, threw out the first pitch last night. He’s retiring after eleven years of the presidency and forty years of service to the college, so that was a nice touch. Smoltz tossed six innings with the PawSox. It was his fourth rehab start, but his first with the PawSox and his longest so far. The PawSox won, 2-1, and he threw 51 of 74 pitches for strikes. Not bad. And this week is draft week. I’m psyched. True, we’re far from a first pick, but that’s the price you pay when you’re good. And knowing Theo and Jason McLeod, our scouting director, they’ll still be able to work wonders. Wow. So we had no-no bids by Wake and Beckett and now a perfect game bid by Lester. You’d think Dice-K would be next in line, followed by Penny at the rate our starting rotation is going. Congratulations to Wake, Beckett, and Lester for more-than-solid efforts and for almost getting it done. To be completely honest, eventually they probably will. And when that happens, believe me, we’ll have some things to talk about. Meanwhile, we’re back in first place by half a game, and Dice-K is pitching opposite Vicente Padilla this afternoon. Hopefully, the Rangers will have been thoroughly demoralized by Lester’s performance and Dice-K’s job will be that much easier.